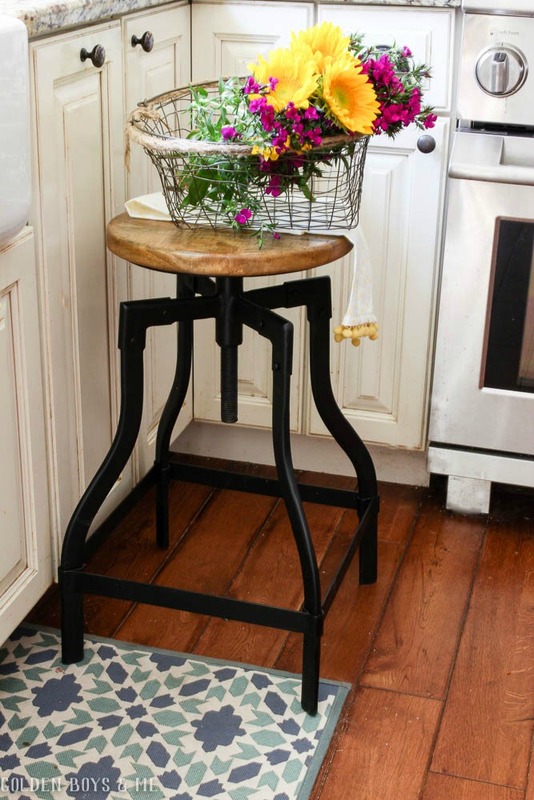 I finally got out the spring decor this week in our kitchen. We are still waiting for spring weather to arrive for more than a day or two here in NJ, but adding some fresh flowers definitely helps. And lots of color. The green Le Creuset pot on the stove is my new favorite kitchen item. I use it almost every night to cook dinner and then I can serve right in the same pot. I just leave it out on the stove because I like the pretty green color and there is no sense in putting it away when I will be using it again soon. 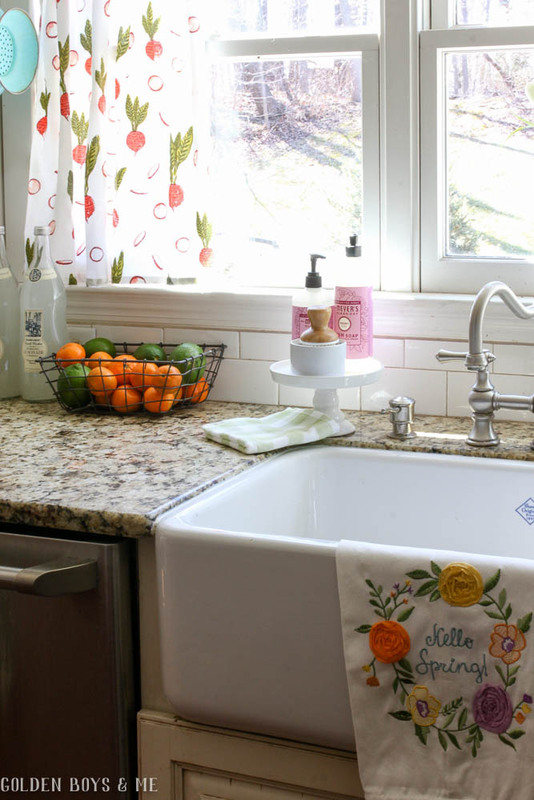 The "Hello Spring" dish towel is new from HomeGoods. I think the radishes on the curtains add a nice touch of spring whimsy. They are made with flour sack towels from Target. I think I might have gone a bit overboard with the spring flowers from Trader Joes, but with so many cold and dreary days I considered them a necessity. Cheaper than therapy, right? 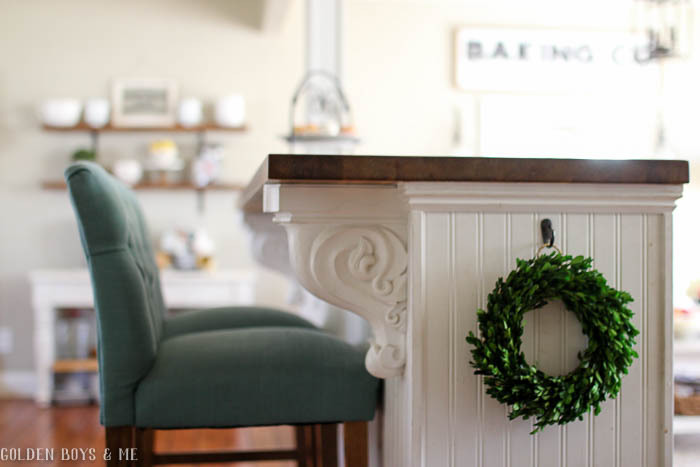 Next up, some spring decor on the dining room side of this space. Now this is Spring! So lovely, comfortable and bright. I especially like the colorful curtains for spring. I need to shop Target more creatively. Ahhhh. Beautiful. So many cute ideas. You are so lucky to have that great view and huge windows. Dreamy! 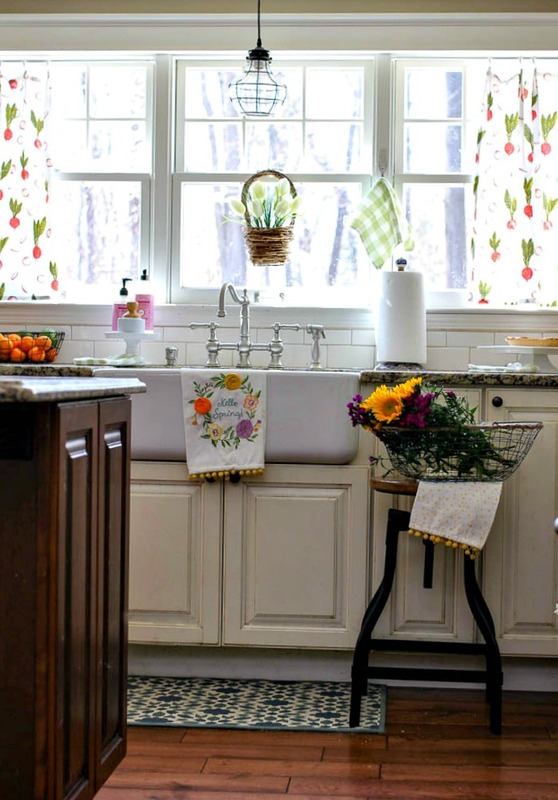 The photo of the kitchen window is so fresh and springy! Perfect! Beautiful Courtney! Hope you have a great Monday. Love it! so fresh looking! 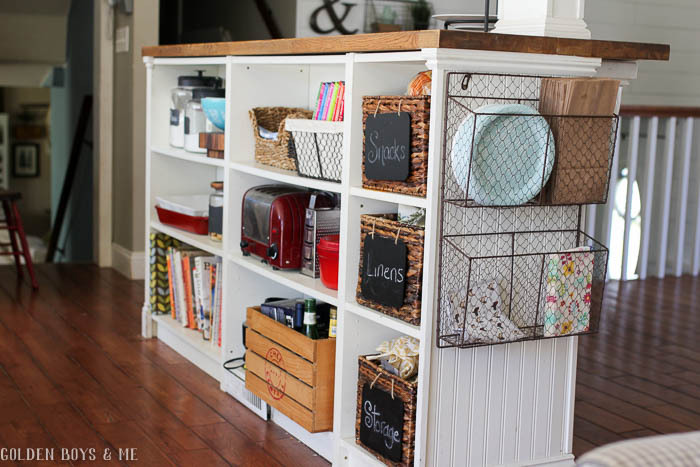 Your kitchen looks amazing, Courtney! 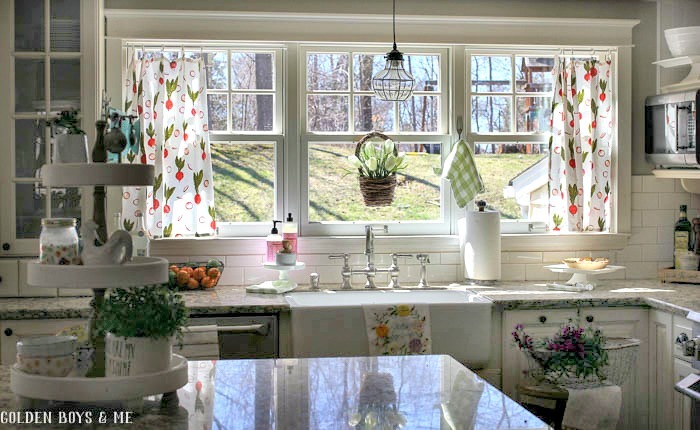 I love that you used those tea towels for curtains. Perfection! Those curtains are too cute. And so unexpected!!! 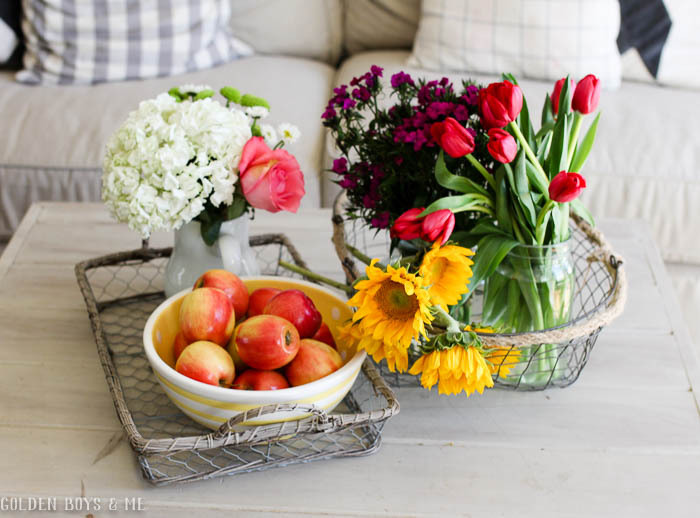 Love them and all your pretty spring decor. You can NEVER have too many flowers in my opinion! Your home definitely feels like happy spring to me, Courtney! So lovely! 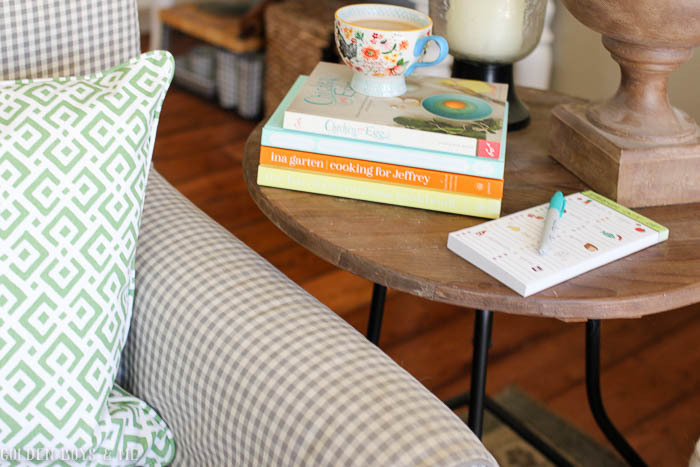 Love your blog post and decorating ideas. I have been looking for a LeCreuset pot and would love to know which one you have in your picture. It looks like a perfect everyday cooking size. Thanks for your time and sharing your lovely home ideas. Your post made me smile, Courtney! 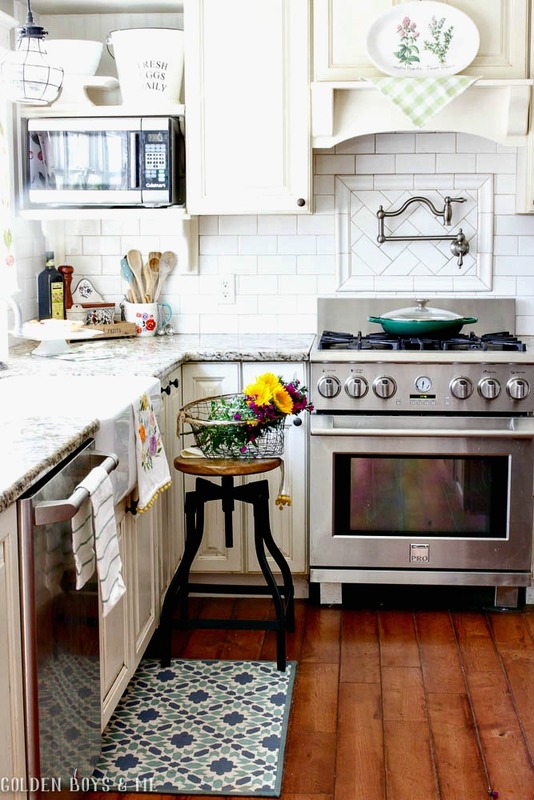 We are all craving spring, and the fresh, light feeling I get from your kitchen makes it seem around the corner! And yeah, bring on the flowers! Soon we will be enjoying them outdoors. 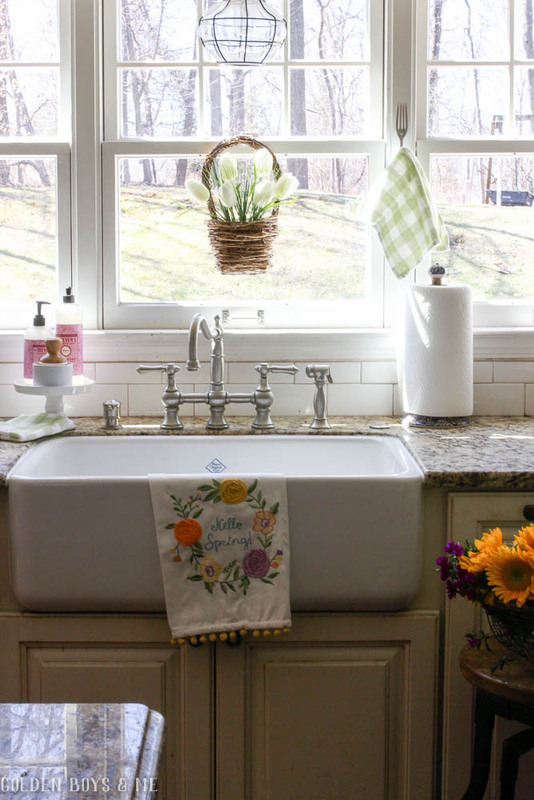 Love love love that sink and windows! 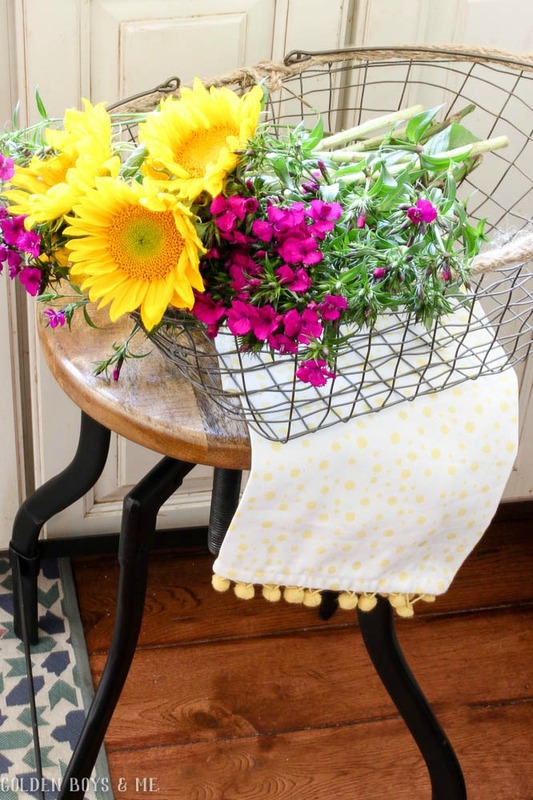 All those flowers and the pops of color are the perfect spring inspiration! You know I'm seriously in LOVE with your house, right? 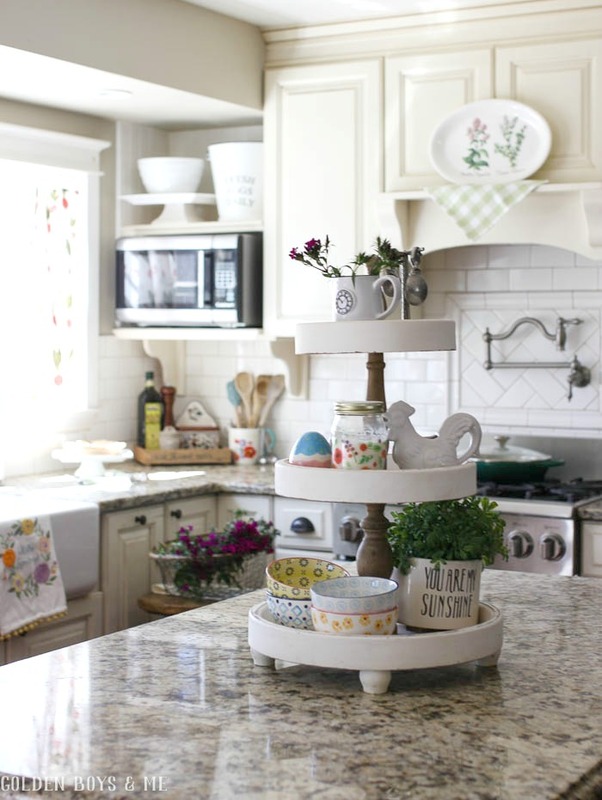 Oh my gosh, these spring touches - just perfect!! I love your flour sack curtains, how friggin cute are you?